32,000kms, 2,300 gallons of petrol (est), 180 days, 84 campgrounds (we counted than last night) and 6 Oil changes we’re coming close to the end. We’re now in Portland and about 300 miles south of our final destination in Seattle. Over the last couple of weeks things have changed. We’ve started to run supplies down and I’m praying the van makes it with no expensive repairs. I’ve also started to think how I’ll get rid of it when we get to Seattle. How much is it worth? (as much as someone is willing to pay!). This blog is probably not the right place to advertise it as you all know what we’ve put it through. Also – I wonder how many are still reading now that the chances of us getting shot or kidnapped have greatly diminished. Susan and I have grown quite attached to the van and would like to be able to bring it home but it does 8mpg, is wider than an Articulated Lorry and would need to be driven to a port on the East coast to be shipped. It’s not going to happen. Now where’s that map of Asia? Susan decided we should hang around near Tillamook for a few days. Plenty to do. 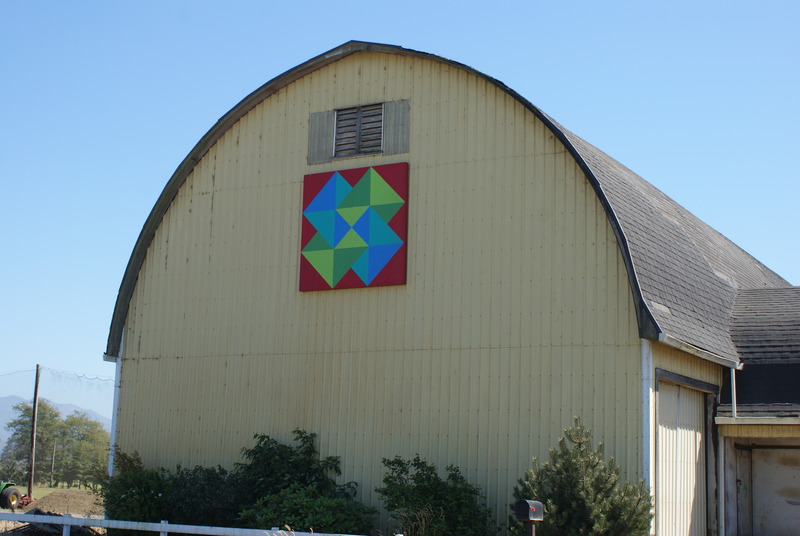 There’s an Air Museum a historic Cheese making factory and it’s the quilting capital of the Northwest. Cool! Let’s start with the museum. They did have a few planes but after visiting the PIMA museum in Tuscan it was a bit of a letdown. On the upside most of them looked like they were still used (lots of oil leaking from them and covered in dirt) and they were housed in a 7 acre hangar which used to be a Blimp base. 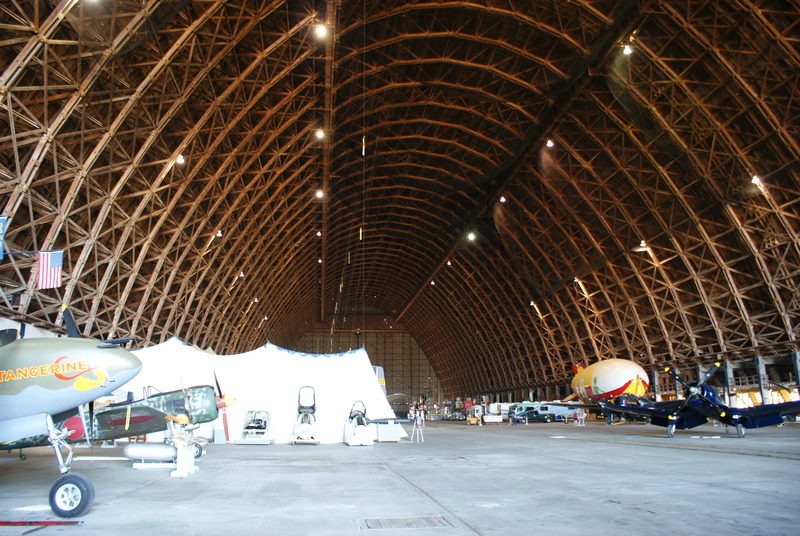 The hanger was constructed during WW2 from wood and was impressive. The lady in the campsite told us the Tillamook Cheese factory was really neat and the most visited tourist attraction in Oregon with more than a million visitors every year! So off we went. She appeared to be right about the visitors. There were queues to get in and once we were in we discovered why. The cheese factory also makes Ice Cream and they give it away free to visitors. The queues were hundreds of metres long and full of people who should not be eating any more Ice Cream. And the historic factory? You could watch large blocks of Cheddar getting wrapped in plastic by a modern stainless steel machine and see an underpaid worker pack it into larger cardboard boxes. 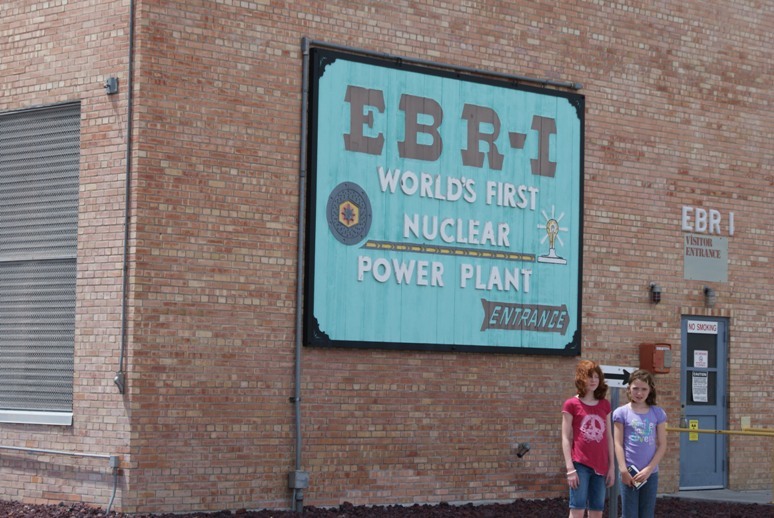 We didn’t wait for the Ice Cream – The Quilting museum and shops were waiting….. I can’t really comment on the Quilting stuff. I stayed in the van and stuck rusty needles through my eyeballs. The preferred option. Even the sheds are quilted! 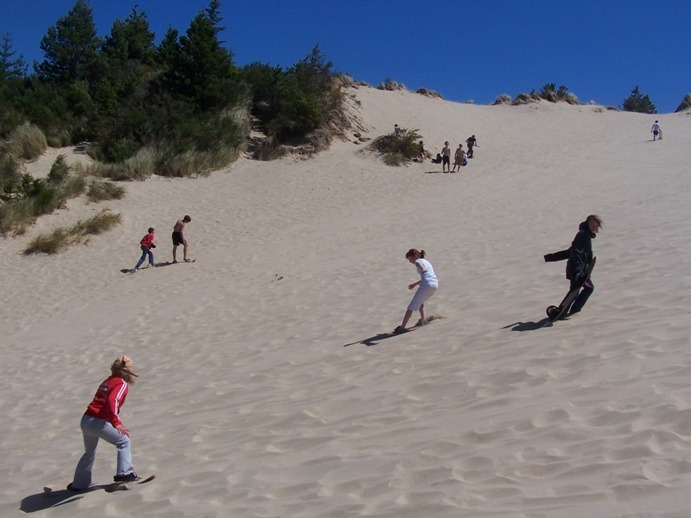 We stopped off for three nights at the Oregon Dunes State Park. The landscape look like what I thought the Sahara would be – Mile after mile of perfect dunes. 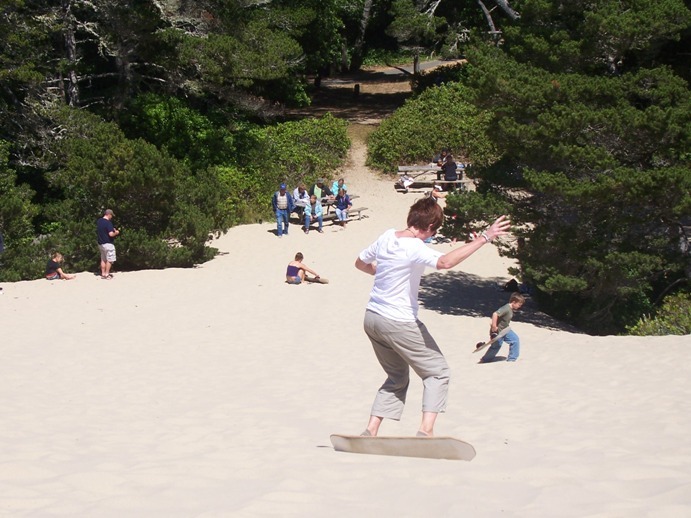 Only difference was the thousands of people on Quads, Dune Buggies and Sand Boards (more on that from Jane in a minute). Parts of it looked like a scene from Mad Max. 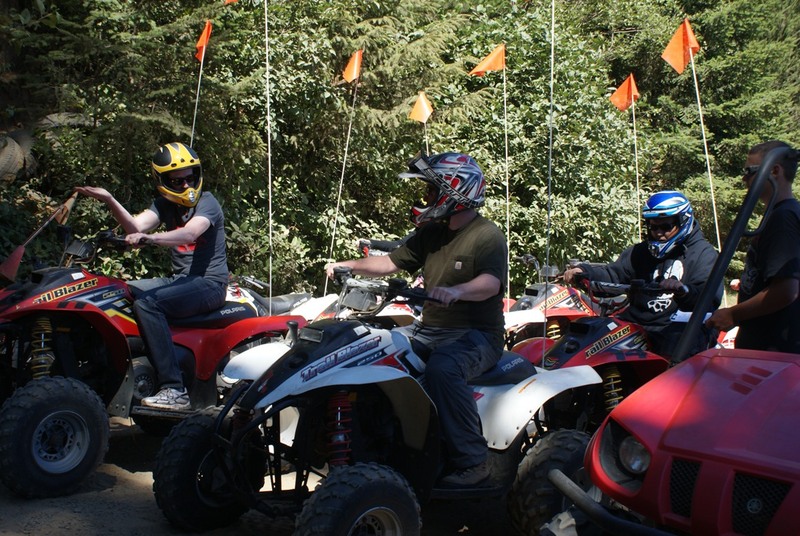 I just had to have a go and rented a 250 Quad just for an hour. I fell off about 5-6 times, rolled it once (they told me it wouldn’t) and got buried so often I lost count. One hour left me in the same exhausted condition as a day at Mondello. Great fun. Next time I’ll bring a passenger to do the digging out though. One thing that’s changed is the weather. It’s COLD and very windy on the coast. Fleeces, long trousers and boots nearly all the time. We left Honeyman State Park on Friday intending to pull into another campsite further up the coast. Every single one was full until Susan managed to make a booking over the phone about 60 mile further north than we intended. Got to the campsite only to find that they had no record of the booking and they were full. It was probably just as well. It was a pigsty and the guy running it looked like Onslow from “Keeping Up Appearances”. We finally found one near Tillamook. It was fine. Dad says I have to write blog. So does Mum. I hate writing blog. Bleh. For me writing blog is like being pleasant or eating healthily is for Emma. If everyone who knows Emma could please take a moment to consider that. Jane says…… Emma had a small fit (the medical kind) this morning because, guess what? She wanted a pancake. Honestly, there are people out there who are starving and would willingly eat a turnip (ugh. ), and Emma is here requesting a pancake. How could she be so selfish? Well, actually it was because we didn’t have any flour, but Emma wanted a pancake anyway. She didn’t want to get out of bed, but at 11 o’clock Dad dragged her out (literally) and plonked her on the floor. I think that must have hurt because Emma started howling, but then again, she did that about the pancake too. I’ve noticed that almost everything I write is about Emma, but it’s understandable; we don’t have a TV. So I watch the Emma show. It’s quite loud and mostly plays reruns but it’s the only thing on. Yesterday Emma observed that the woman next door was “medicating”. She was actually meditating but I might let her off that one because both things are pretty weird. I can’t let her off the next one though. Dad told her that if she didn’t drink her milk she would get osteoporosis and be paralysed at the age of thirty. Then she turned around to Mum and asked what osteospertosis was. I pointed out to Jane that when doing creative writing in school she may need to expand on her subject matter. Her answer was “Why”? It doesn’t always pay to take the scenic route. We found this to our cost as we headed for the Oregon coast on Monday. According to the map the road had several recreation areas (parks) en route. Our plan was to choose one of these for the night. However, it turned out that the whole forest area was a recreational area, and for 35 miles of narrow, winding roads we met three vehicles. No houses, no campsites. 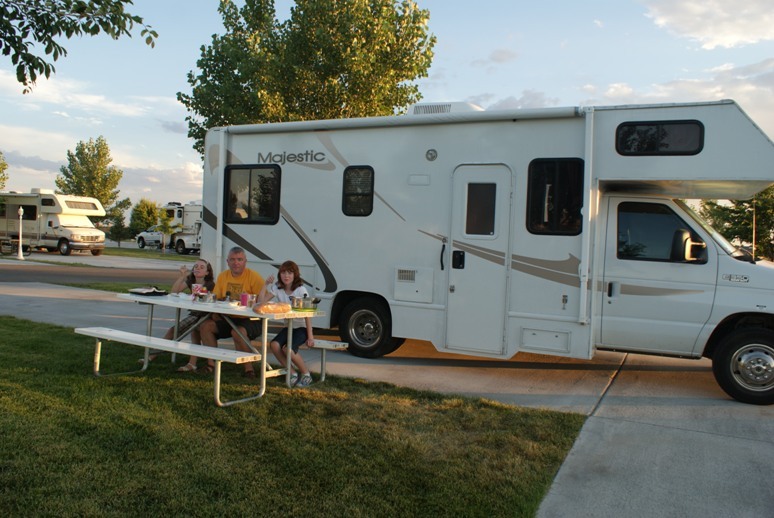 When, eventually we found a campground it was a nice location beside a river but that other occupants looked like they lived there a long time, had lots of dogs and babies running around in nothing but disposable nappies. They looked at us like we were “real strange”. 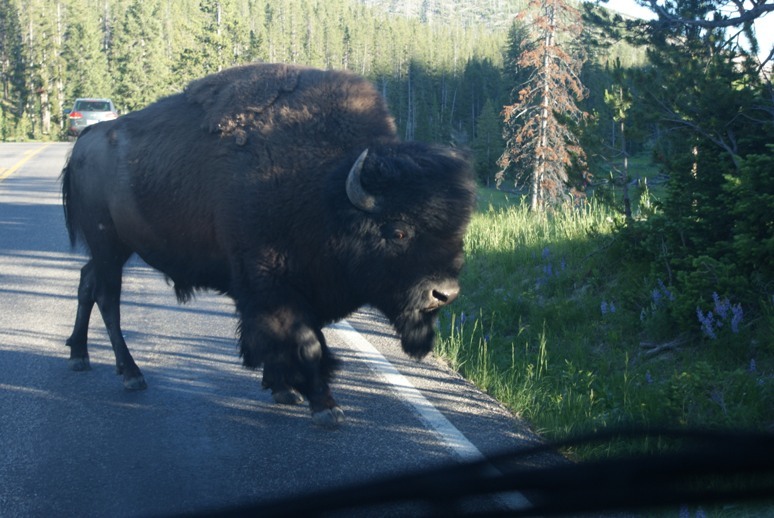 No photos – we weren’t sure if the natives would take the camera. Arrived in Crater Lake National Park on Sunday morning. 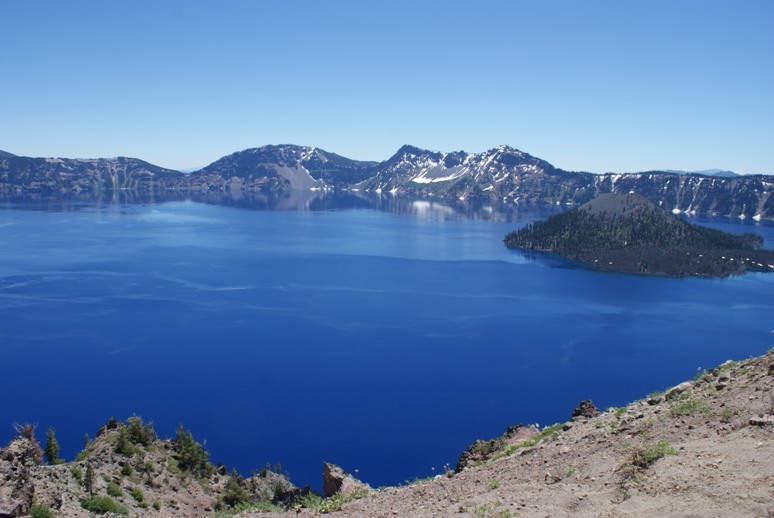 It’s incredibly blue, due to it’s depth, the deepest lake in the US. 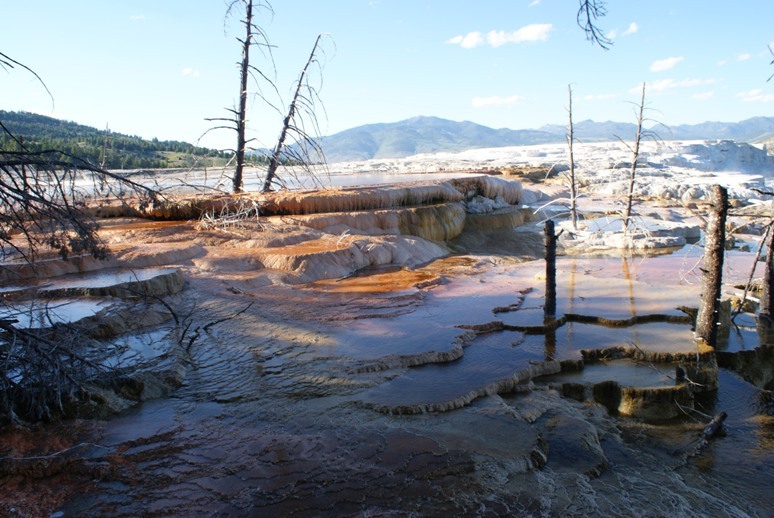 It is the result of a volcano which erupted, collapsed in on itself and filled with rain and snow. There were still huge amounts of snow around the park that have yet to melt. Falls of snow during the winter have been up to 44 feet. 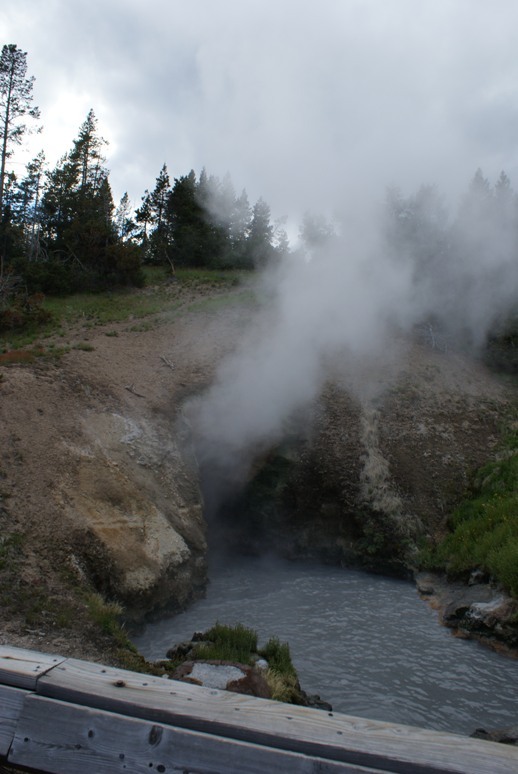 Due to the elevation of Yellowstone and Crater Lake, the weather has been quite chilly. Campfires are needed if we are sitting outside in the evenings. 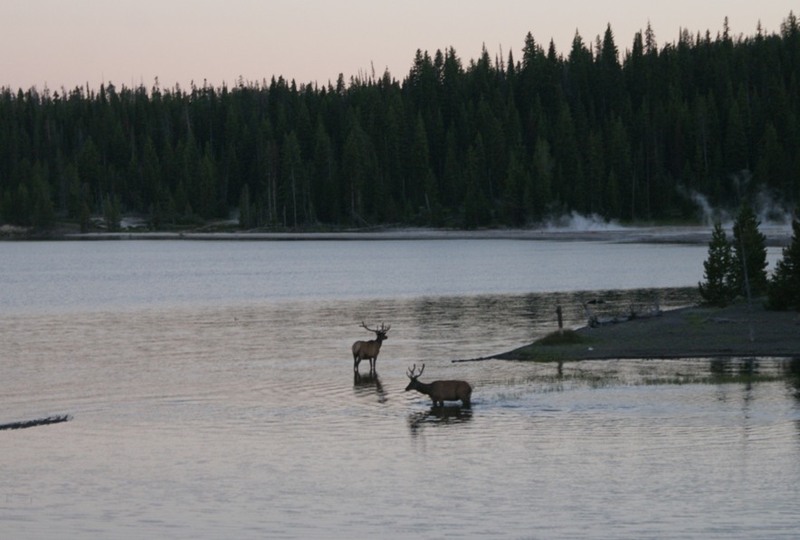 While in Yellowstone Ian got chatting to our neighbour in the campground. The girls keep slagging him, and report “Dad’s looking for a new friend again”. He’s had his fill of female company! 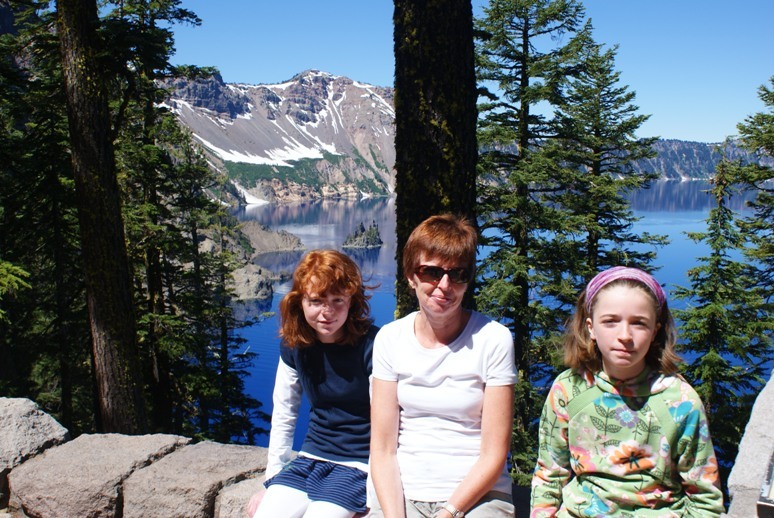 Anyway, his friend recommended that we visit Crater Lake National Park in Oregon. It took two days of driving through Idaho and Oregon to get there. We avoid the interstates if possible, and take the scenic routes, or at least the roads that take us through the towns and villages. The journeys are much more interesting and we get a glimpse of how people live. Somewhere very hot in Idaho. 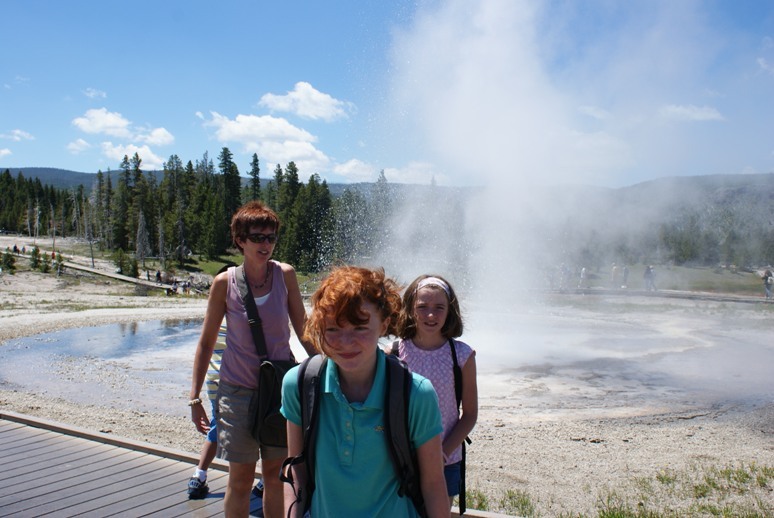 We left Yellowstone in long trousers and fleeces and opened the door in Mountain “somewhere or other” in Idaho to 35 degrees at 7pm! 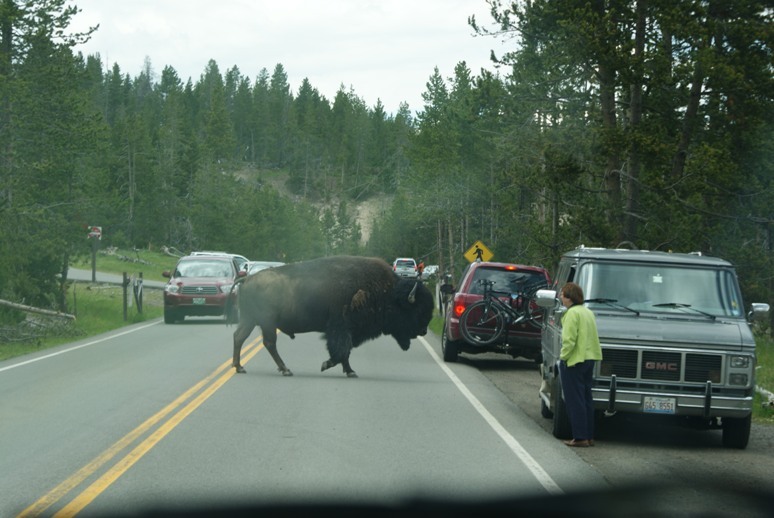 We enjoyed our stay in Yellowstone. You’ve seen from the photos that it’s a pretty spectacular place. 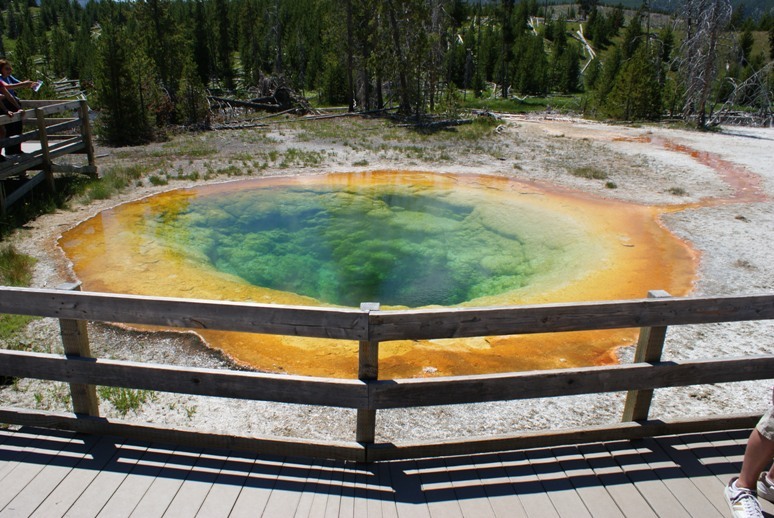 After a long wait we saw the Grand Geyser erupt up to 250 ft, we saw the hot springs bubbling away, mud volcanoes spurting and pools that were amazing colours. 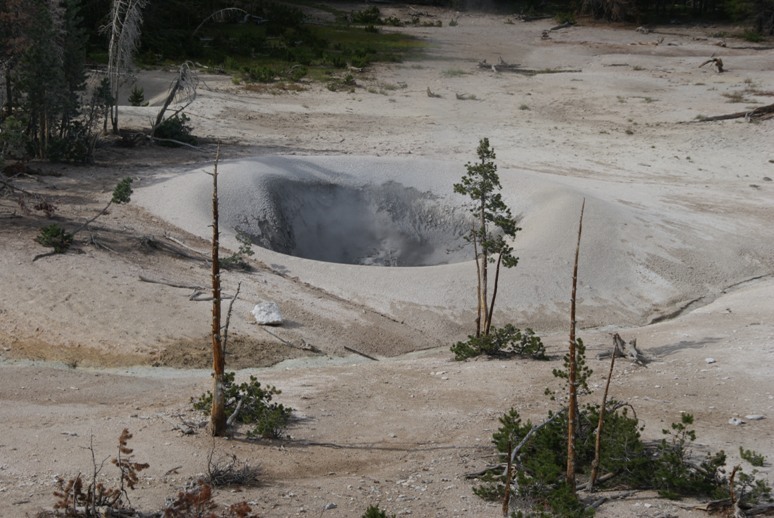 Most of Yellowstone is actually the crater of a still active volcano, the last eruption taking place 640,000 years ago. Jane had the calculator out to calculate the chances of it erupting during the 5 nights we spent there! She had something else to worry about too – The bears. This is bear country. We went on several hikes, but one took us through a forest that appeared to be empty apart from us, and possibly a few bears. She insisted that we talk very loudly or sing as we went along to warn them of our approach. 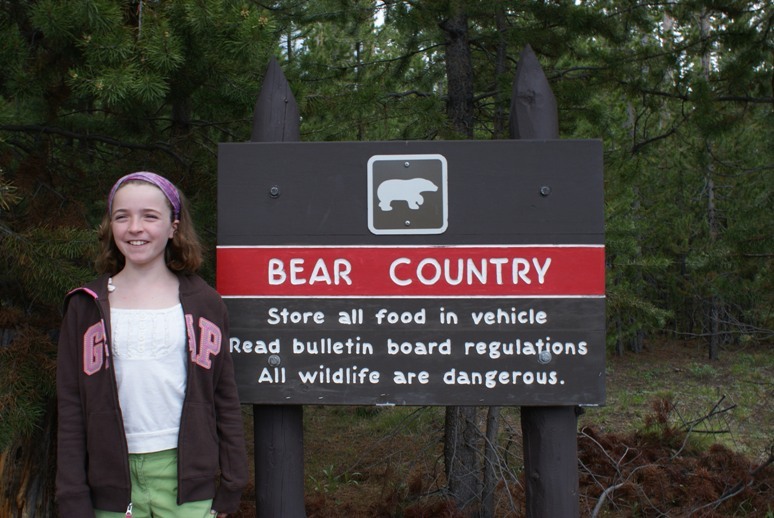 We were eventually driven out of the forest, not by the bears though, but by mosquitoes, much more vicious. 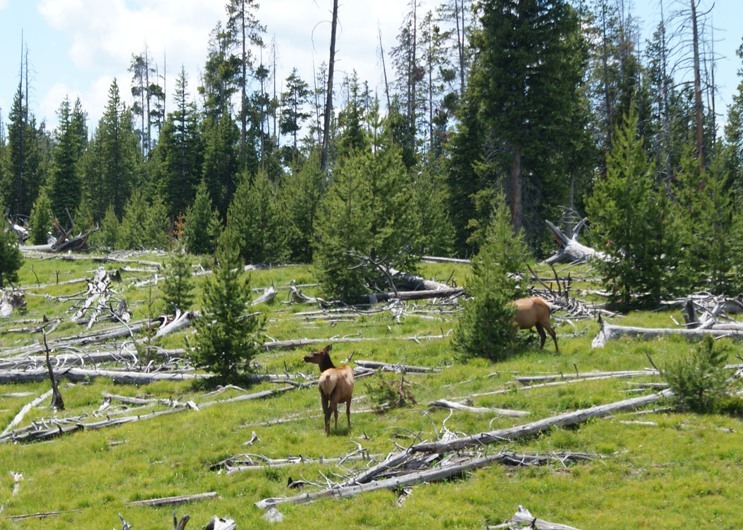 We only saw one grizzly bear during our stay, but met several Bison, Elks and Mule Deer. Emma did the Junior Ranger programme while we were there and Jane did the Young Scientist programme. They are quite involved and take a bit of research, so it’s all good. Parked up in Yellowstone National Park for 5 days (at least that’s how long we’ve booked into the campsite in Grant Junction). 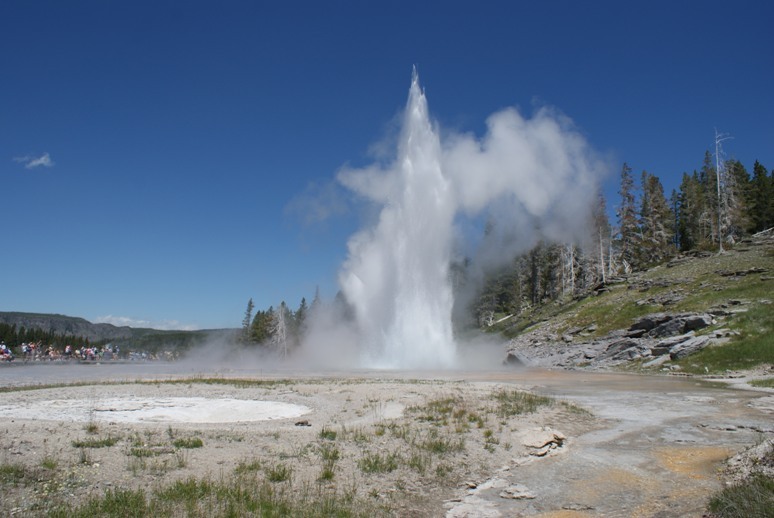 The neareast Internet is 17 miles away near the Old Faithful Gesyer so short on words today. Here are some photos. 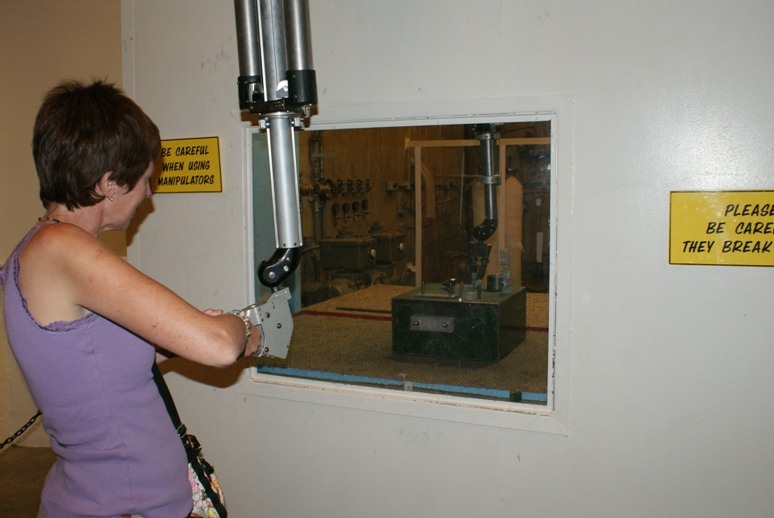 We got to play with the manipulator arms – like the ones they used for “messing” with the nuclear stuff. Arrived in Grand Teton late Friday evening. 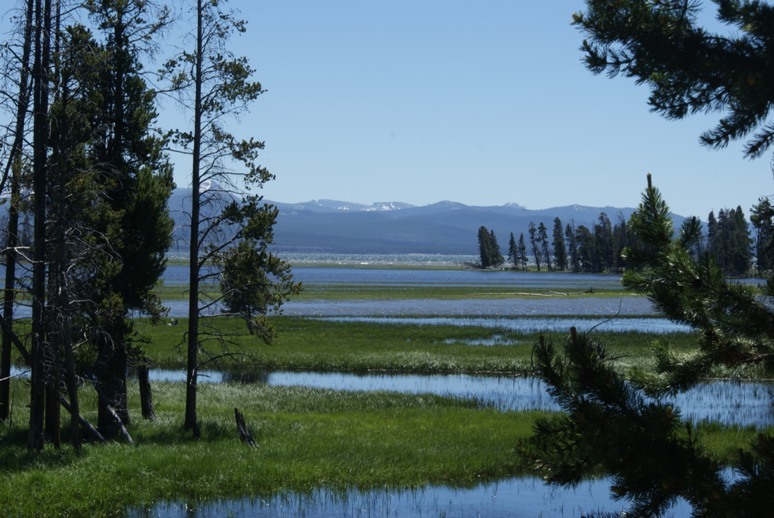 We visited Jacksons Hole the following morning, described in the guide book as, “as Jet Setting as Wyoming gets”. It was a tourist hellhole. 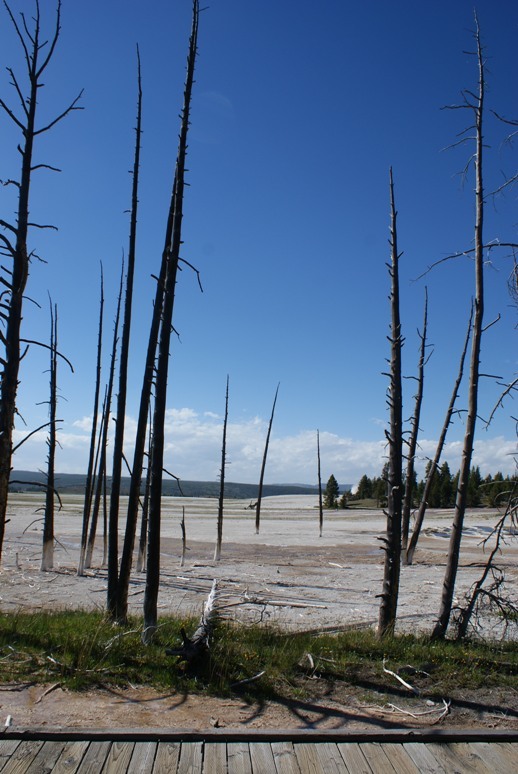 Did some walking in Grand Teton. 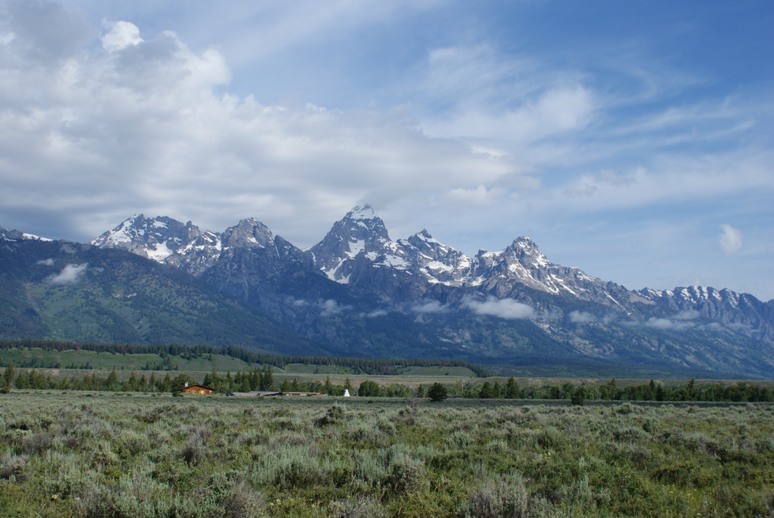 Grand Tetons – I’m not that impressed! They’re really serious about this around here. We were given a 15 minute speach about the dangers. I’ve tried leaving the kids out. No luck yet. 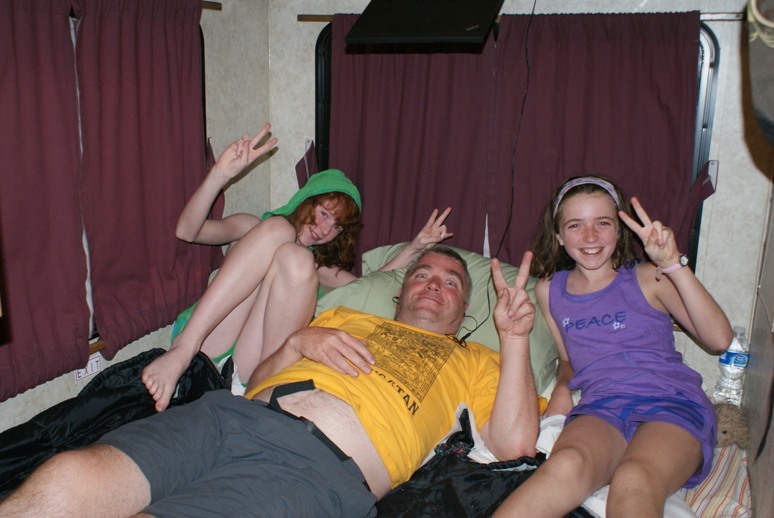 You are currently browsing the Grumpy and the Girls go to the Americas blog archives for July, 2010.